I was born in Tg. Mures, Romania in 1930. Studies: Institute of Arts Ion Andreescu, Cluj and Nicolae Grigorescu, Bucarest, which I graduated in 1957. 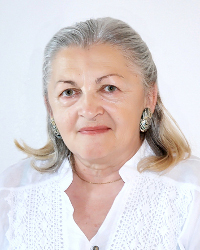 I have been membre of the Romanian Association of Artists (UAP) since 1961. Personal exhibitions in Tg. Mures in 1972, 1975, 1979, 1982-1983, have participated at the collective exhibitions organized by UAP in Tg. Mures and Bucarest. In 1983 5 works exhibited in The Netherlands at the Romanian graphics show. I make drawings using ink pen and coloured ink, etchings in various techniques. Favourite topics: home town – both contemporary and historical, scenes with images of women in different contexts, reflecting their position in family or related to environmental issues.